Man crosses street in front of Pike Place Market’s Public Market sign on Wednesday, March 6, 2019 in Seattle, Washington. Democratic presidential candidate Beto O'Rourke speaks to a crowd in Heritage Hall during his meet and greet on Tuesday, March 19, 2019 at the HUB Building at Penn State University. 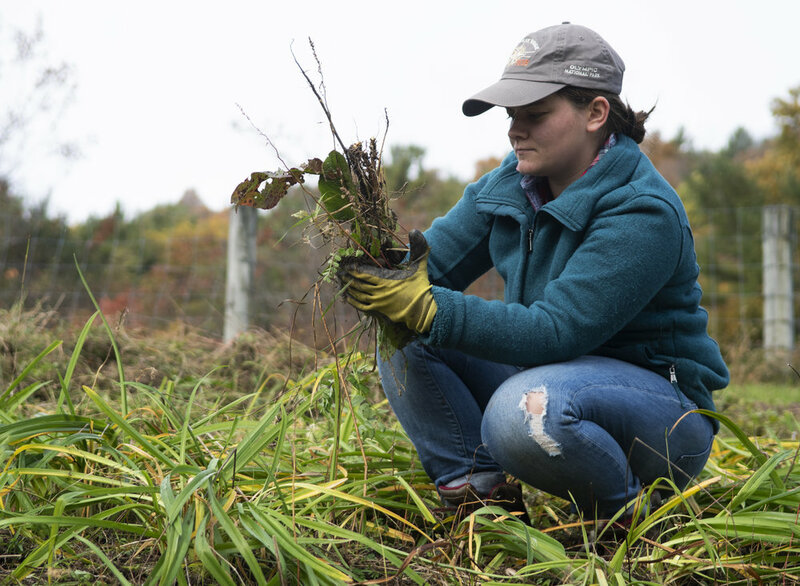 Deanna Homan (junior-plant science) pulls weeds during the Crop Mob event at The Barn on Valley View Road in Bellefonte on Nov. 3, 2018. Forward Lamar Stevens (11) answers questions during Penn State men's basketball media day at the Bryce Jordan Center on Tuesday Oct. 16, 2018. Krittika Shahani (freshman-computer science) gets powder thrown at her during the Hindu festival, Holi, hosted by the Indian Culture and Language Club and South Asian Student Association on Sunday, April 7, 2019 at the HUB-Robeson Center lawn. Mason Ramsey performs during THON at the Bryce Jordan Center, Saturday, Feb. 16, 2019. Two opposing fans shake hands while FC Cincinnati fans march to the Seattle Sounders FC vs. FC Cincinnati match on Saturday, Mar. 2, 2019 at CenturyLink Field in Seattle, Washington. Debra Trose of Altoona smokes a cigarette during the ZombieTown USA Zombie Prom at the Altoona Railroaders Memorial Museum on Friday, Oct. 5th, 2018. Keith Hardaway (sophomore-biobehavioral health) serves a volleyball on the lawn of Old Main on Tuesday, Feb. 2, 2019. Jordan Mathis (freshman-mechanical engineering) marches with a "don't tread on me" flag at the Come and Take It, Hogg protest at the Allen Street Gates on Friday, Jan. 18, 2019. Daniel Testa, age 10, throws a plastic football during THON at the Bryce Jordan Center, Sunday, Feb. 17, 2019. Chris Brown, of State College sings and plays the guitar outside of the Corner Room on East College Ave. on Tuesday, Feb. 2, 2019. The Rockets perform during THON at the Bryce Jordan Center, Sunday, Feb. 17, 2019. Victoria Romeo of Altoona waits for the ZombieTown USA Zombie Prom to begin at the Altoona Railroaders Memorial Museum on Friday, Oct. 5th, 2018.